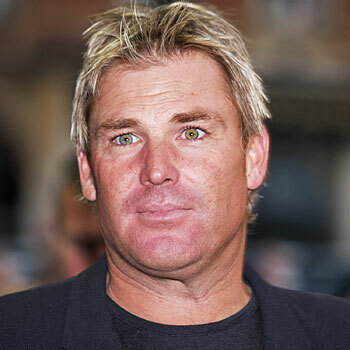 Just found this picture of the "new" Shane Warne. This doesn't look like him at all. What do you think? I think he's been working out and got a new wardrobe as the ladies say. What do you think? Just wondering, did you realize this is the same girl I posted about on page 1165? Allison Harvard, 2009 runner up ANTM. Where I said this one doesn't look like she needs much tinkering? I looked her up on Wiki and see she had a flicker account. Really creepy stuff - lots of blood, white rabbits, needles in eye. I'm sure she must have been ritually abused. It looks like she draws pictures of her many alters. Check it out yourself and see what you think. Check out the name on the pic, weird synch or what? She def appears to be painting different versions of herself, including the faceless one often associated with multibles. Can't post pics for some reason, but their is one called Oslo of all things and, of course this is open to interpretation but othis persona appears to me that she could be inside an island with a blood shore. Last edited by marisabia; 15-08-2011 at 06:53 PM. Reason: cause i'm having a bad hair day. Jesus Christ is the way, the truth, and the life. No one comes to the Father except through Him. Last edited by thethinkingrebel; 15-08-2011 at 07:28 PM. haha, I dont know if you got what I meant. Oh...okay, yea I was not aware of this whatever you want to call it, I can just imagine the number of creepychans that will be spawned by this new abomination/monster they have created, as all the young girls follow in the footsteps of this poor girl who appears to be just bearly clinging to life all the time. I've never seen him before and when I looked up images of him it's hard to tell cause his face is always contorted in extreme facial expressions but he is strange looking , anyways what I'm trying to say is you never know. I just thought wtf when I saw that pic. He used to be rugged. This makes me shudder. No normal man would do that to himself. Plenty of men go under the knife and don't come out looking like that. As someone commented on that linked page, he looks like Liz Hurley now. Last edited by armoured_amazon; 15-08-2011 at 08:57 PM. Not sure he's gone under the knife. Looks like weight loss to me. A mid-life crisis will make some people make some drastic changes to their lifestyle. Last edited by bobthegoon; 16-08-2011 at 07:30 AM. Man does Liz Hurley's neck look super long in that pic, and the back part of the neckline looks bizaare to, as if she has some kind of hump back there, not that she does, just saying. Cameron Diaz look frightening in that photo. Cameron went from a full-lipped, wide-hipped, large-arsed, ample-breasted, latino looking beauty, as seen in the photos above - to a narrow-hipped, small arsed, flat chested thin-lipped caucasian looking woman, as seen in the photos in the post below, in less than the space of a year. Last edited by bobthegoon; 17-08-2011 at 08:50 AM. Just a browse of her IMDB comment page shows you her change is obvious, it's just that all but a few will put it down to aging. Hardly scientific but I think interesting nevertheless. Wow.....born 1972? I thought she as nearly 50! Is she a white latina? The switch happened directly after The Mask, the replacement's first film was 1995's The Last Supper. Last edited by bobthegoon; 17-08-2011 at 09:31 AM. Good finds. Cameron, different soul, pretty obvious in the eyes. Looks like a walkin. Remins me of Kylie Minogue. Last edited by whale; 17-08-2011 at 02:41 PM. What happens to the originals after they've been replaced? They kill them? Imprison them? What? Keep them in the fridge? Send them elsewhere? What about their family? They are under the impression that the star system is responsible for their total changing? Cameron Diaz does not naturally have full lips. She can thank her make-up artist for that. You can see in the photos posted that the lip liner/lipstick extends beyond her natural lip line. It's really hard to judge from these celeb pics because practically everyone in Hollywood has been altered by surgeons, make-up, Botox, aging/fighting aging, extreme weight loss, ect. Also, facial bones change as you age and you also lose fat in your face. Most of these people are probably getting fillers injected or even facial implants.